A DAN Member recently asked if we had an example Scope & Sequence for Prep-Yr 10 RE that was aligned with ACARA and addressed the General Capabilities? If you have recently revised your RE Scope & Sequence and would be amenable to sharing this with other DAN Members, your generosity would be greatly appreciated. Please do contact the DAN EO if this is something you could help out with. to be held at the splendid new Function Centre at Somerville House, overlooking South Bank in Brisbane. 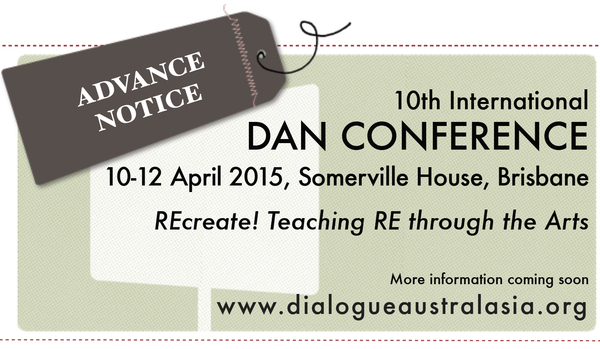 If you have any suggestions for Keynote or Workshop Presenters, or know of any luminaries in the Arts & RE that are booked to be in Australia over April 2015, the DAN EO would love to hear from you. 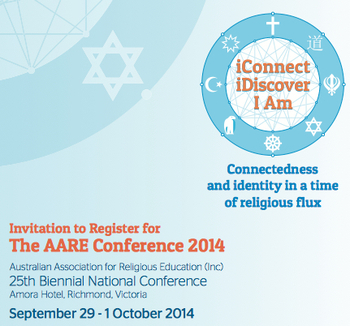 Full Registration will be approximately $575 for the 2.5 day Conference. Boarding House accommodation in the excellent new facilities at Somerville House will be available to delegates, and there are Hotels to suit all budgets in South Bank, an easy walk from Somerville House. Teachers who attended the June/July DAN PD workshops with Brian Poxon were nourished with 'a day of full of valuable resources, stimulating discussions and practical ideas to enrich classroom practice' (feedback from many who attended). An email with links to access all the materials (PPT, supporting notes and resources) shared during the workshops has been sent to participants. If you require a Certificate of Attendance for your PD records, please contact the DAN EO. RESOURCES FOR ALL DAN MEMBERS: A summary of links to online resources that Brian shared during the workshops can be accessed by DAN Members with current passwords. Click here to download. If you have yet to renew your 2014 DAN Membership or Dialogue Australasia journal subscription, please do make contact with the DAN EO (I will happily email a copy of your invoice). Regrettably, if I have not heard from you by September, you will not receive a copy of the 32nd Issue (Nov 2014) of Dialogue Australasia journal. Passwords to access online resources on the DAN website were reset on 1 June, and financial members advised of these details. If you have any difficulties accessing resources, please do contact the DAN EO. You know your DAN Membership gives you access to resources on the DAN website, but do know what resources are buried deep in the archives? Over 2014 the DAN EO will unearth some of these resources for you to (re)discover. Please do contact me if there is any area of your RE curriculum that you are particularly keen for resources in....we may just have something online to assist! 3. Articles from Dialogue Australasia Journal, Issue 25, 2011: And Two She Bears: On Opening the Bible to Young Minds by Joseph O'Hanlon and 'To throw alongside of' - Storytelling in the Primary Classroom by Donna Jacobs Sife. If you have any difficulties accessing these resources (using your 2014 Password), please contact the DAN EO. I was delighted to discover that the two excellent resources from The Wonder Project: Primary Questions (Yrs 3-6) and Questioning Origins (Yrs 7-9) are now accessible again (via UK suppliers). Primary Questions: Begin to Wonder offers 6 engaging cross-curricular lessons that encourage Primary students to wonder at the world they live in and ask questions about how and why it exists. The DvD resource enables teachers to lead great, interactive lessons exploring issues around creation and evolution - even when they may feel this is not their area of expertise. The materials include video clips, PPTs and games, supported with comprehensive lesson plans and teacher notes. * Our spiritual culture at the moment is so impoverished and primitive. People find it extraordinarily difficult to be serious about angels or discarnate energies. * It’s a very modern tragedy that religion has become ideas in the mind. That’s why western religion is so feeble. * But alas we do not have many places where one can go today to learn and practice contemplation – we are very needy. * We don’t seek illumination from the whole but from bits and pieces. This is one of the reasons why this civilization is in grave peril. * The real trouble with the Church is not that it has retrograde social attitudes, or hasn’t embraced the emancipation of women – it’s that it’s spiritual incredible. It’s just as shallow as the rest of us. Fr Christopher Gleeson SJ, Provincial Delegate for Education and Mission Formation (and DAN Patron) gave a wonderful presentation to the Marist Faith Formators’ Colloquium at Mittagong on 24 March 2014. When you are in need of a jolt of inspiration for the challenging and important work you do as RE teachers, make some time to digest Chris' full text, excerpts of which are printed below. ...The test of whether our education is one of depth, is whether we are able to produce people who can “decide from inside” - which is another way of saying...are able to produce people of discernment? Help me see that nothing here below is profane. Read the full text of Fr Chris' presentation. The first centre of its kind in Australia, the newly opened Islamic Museum of Australia aims to showcase the rich arts, history, culture and heritage of Muslims in Australia and abroad. 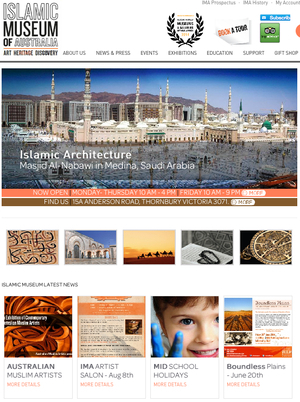 The Museum also has a mandate to promote new and established Islamic artists, both local and international. In addition to educational tours for school groups, the IMA has commissioned an educational online resource of the Australian Muslim History and activities across the galleries to be implemented and provided to teachers across Australia. The new MA in Religious and Values Education through CSU offers an excellent, flexible, online study option for teachers looking to acquire and extend their knowledge in RaVE.